Several weeks ago we posted a news insight article on Tony Hsieh’s bold experiment with holacracy at Zappos.com, a division of Amazon. The New York Times’ recent account of the culture at Amazon.com (see “Inside Amazon: Wrestling Big Ideas in a Bruising Workplace” ) highlights an entirely different approach to management at the parent company. The report casts a harsh light on the culture at Amazon, but that’s not the focus of this commentary…I am in no position to know the truth and can only say that while overall reviews at Glassdoor.com give Amazon a good rating (3.4 out of 4), the comments echo those made by people quoted in the article – that Amazon is a highly competitive, pressure-cooker environment with little cultural respect for work-life balance but has lots of opportunity and is great for people who don’t necessarily need that and who like to compete. From an employee’s perspective, especially a top engineer who can work elsewhere, one can’t read those principles without asking: This is all great for Amazon, but what’s in this for me as an employee? (I feel exhausted just reading those principles and I’ve worked many a 60-hour week.) Based on its market share objectives, these principles appear to be working for Amazon, but what’s not clear is the hidden cost of overlooking the work-life balance and teamwork of employees and the loyalty to vendors and communities that are the principles of companies such as Costco, Starbucks or Whole Foods, who do consistently generate a profit. The New York Times asserts that Amazon has exceptionally high turnover and quotes Seattle-area recruiters saying they encounter a lot of disaffected Amazon workers at a time when the company has many job openings due to its rapid growth. An Amazon spokesperson denied that turnover is abnormally high, but the company doesn’t deny that its culture pushes out those who can’t make it. 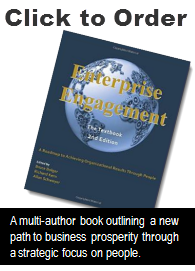 So, which type of management style will prevail in this new era of engagement? Do companies that create highly competitive, continually measured, fast-paced work environments consistently attract the great talent at all levels without an equal focus on the wellbeing of talent or vendors or communities, for that matter? I’d argue that Amazon can continue to succeed without enterprise engagement but that it will cost more to recruit people and retain people, and that this type of media coverage will eventually erode its brand equity (as Walmart discovered). No, investors won’t see the direct costs, the company doesn’t have to report turnover or related costs or its average pay package per employee, and no one can measure the cost of people who wanted to “think big” but who were quashed by stronger-willed people, if accounts of this nature reflect the culture. Amazon won’t lose legions of customers, but it’s just one more PR black eye that takes some of the “wow” out of the brand. People like to work for and do business with nice companies, and I’m sure a bunch of top engineering grads with as much talent as comparable people at Amazon will see articles like that and say, “That’s not for me.” Amazon’s principles suggest that Bezos believes that in its “customer obsession” it doesn’t have to focus equally on all of the individual human beings who actually deliver those promises, and he’s right. It just might cost him more and be a little less fun than necessary.